Last year, a bunch of friends and I went blueberry picking up north and made a full day out of it with berrypicking in the morning and jam making in the afternoon. Anyhoo, I had a few cups of blueberries still left over from last year (oops, kinda forgot about them), so I figured I’d finish them off before we go blueberry picking again next week and I’ll be restocking with fresh blueberries. I remembered a recipe that an old acquaintance of mine–Jin Kim–made for my Houston church a few times. 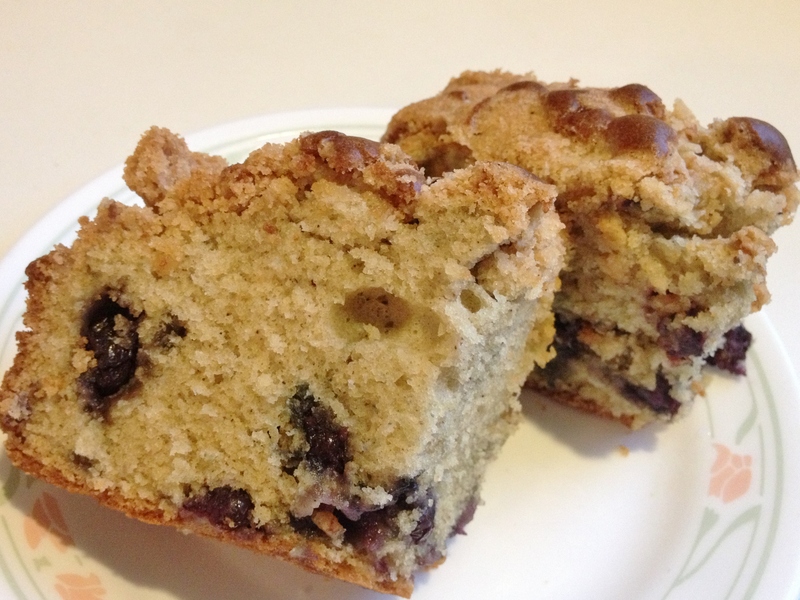 He used to keep up with his blog more regularly, but luckily his recipe for blueberry crumble cake (one that he adapted from dorie greenspan) is still up there! I made a few changes….basically I took out a good amount of sugar the recipe calls for so I wouldn’t feel as guilty eating it. 1. Preheat oven to 350. Butter an 8-inch square pan and put it on a baking sheet. To make the crumble, put all the ingredients in a food processor and pulse until it forms clumps. Set aside the topping in a bowl. Then take 2 tsp of flour and toss it over the blueberries until they are coated. Then take all the dry ingredients (the remaining 2 cups of flour, baking powder, baking soda, salt, cinnamon, nutmeg) and set aside in another bowl. Using a mixer, rub the sugar and lemon zest together with your fingers, then add butter and use a low-medium setting for 2-3 minutes until the sugar and butter are churned together. Then add the eggs, vanilla extract, flour mixture, then buttermilk. Keep mixing until the batter is thick and creamy. Stir in the berries with a rubber spatula and scrape the batter into a pre-greased 8-inch square pan (I don’t have a square one, oh well). 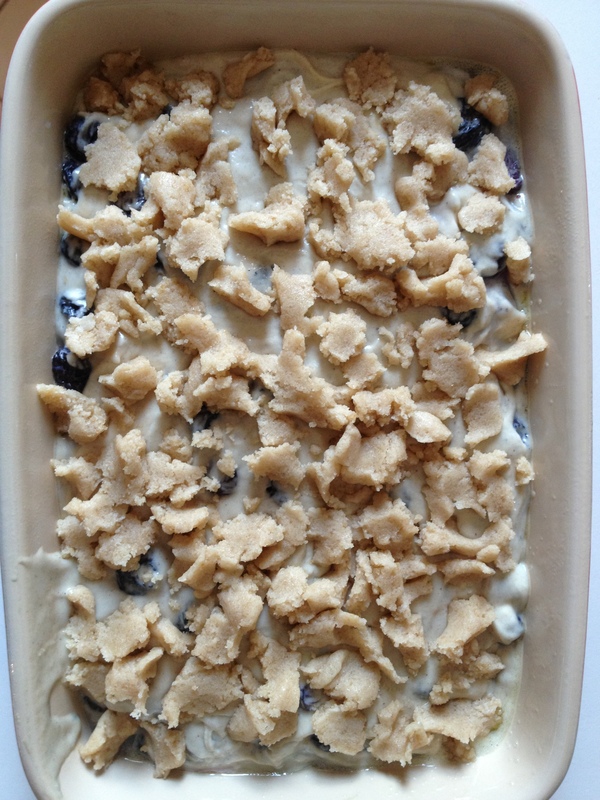 Using your fingertips, break the crumb mixture over the batter. Bake for 55-60 minutes at 350. Let it cool a bit before you eat!